Lizards are relatively rare in the fossil record, in part because they tend to be small and are made up of delicate bones. 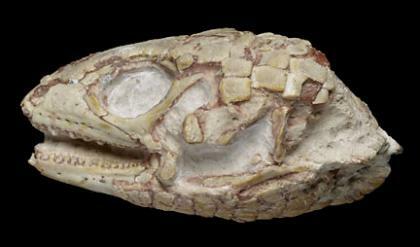 This nicely complete skull of Peltosaurus from the Science Museum's collections is an exception - it's easy to see the teeth, the eye opening, and the two openings behind the eye that classify lizards and their relatives as diapsids. Lizards and snakes are more closely related to crocodiles, birds, and dinosaurs than they are to turtles and those reptiles that gave rise to mammals. This particular lizard is a "cousin" of today's Gila Monster. Some of the thick scales covering the skull are also preserved on this specimen. This fossil was found in South Dakota, in rocks that date back to about 34 million years ago.